Daring to live life as a full time writer, with or without success. Over on Elizabeth Spann Craig's Writing the Cozy Mystery this week, she's writing about developing a mystery series, and things to think about when developing your sleuth. Someone in the comments asked a question: can a small town have a police chief? Short answer: yes, any size town can have a police chief. IF they have a budget for a police force. However, there are a whole lot of variations on how small towns are policed (including "not at all"). And it varies even more by region. (An American "constable" in one state has a whole different meaning than in another, for instance. And it's all very different than a British constable.) And even though cozy mysteries are not "realistic" and your fictional small town may be a fantasy, it's still important that the town have an authentic flavor. I mean, as readers, we want it to feel like a real, if very comfortable, place. And since I am currently up to my ears in regional/historical research, I figure it's time to talk to you about doing some easy online research into towns and police forces. Your tools will be Google Maps, Wikipedia, and then Google Search. And, of course, a healthy dose of amateur-sleuth curiosity. There are a whole lot of more advanced tools that you may enjoy, but you won't need them unless you start sliding from "cozy" into one of the more traditional mystery areas (such as historical or regional mystery). This will go a lot quicker if you already have a town or region in mind. And you may already have that: a town where you grew up, or visited or even live right now. If so, great; you can skip to the step with Wikipedia. However, if you haven't been to this town in a while (or just never get out), you may want to play around with this step, because it can be fun. Also if you want to disguise your town -- fictionalize it -- you may want to research some similar towns to give you some variety of details to change. The other thing to think about is what kind of stage this town will set for your story. Do you want your sleuth to be able to walk around the town to talk to people? Do you want there to be a Main Street? And what about side streets? Should there be more than one diner or restaurant in town? How far from a mall or movie house? Should there be a back street or dark alley where you can set some skullduggery? Maybe even a suspense scene, as your sleuth pursues or is pursued by a mysterious dark figure. Or is it more the sort of place where there are four or five buildings at a cross roads, and your sleuth has to drive her truck from farm to farm to talk to witnesses and suspects? When you have an idea of the kind of activity you'll have in your story, you'll know what your town "looks" like in terms of a streets and such. So we know the region, and what the town will look like... but is it a town that will support a police force? Will the town have a mayor, or just a city council? How big of a town do you need for what you want? We'll start our research by looking for real towns in the region we want, which look about right in terms of the street maps. First of all, if you are not very familiar with it, you can start by clicking on this Google Maps Link, and more than likely it will take you to whatever town you happen to be in now. (If it can't tell what town you're in, it will probably show you a map of the U.S.) If the region you are looking for is nearby, then click on the minus button in the lower right corner to zoom out. (The plus is for zooming in.) And you scroll around the screen by clicking on the map and dragging it. So you get to your region -- stay a little zoomed out, so that you can scroll around and browse for towns. When you see a likely town, zoom in on it. Do you like the look of the street map? Can you work with that as a dramatic stage for your series? Check it out with "Street View." If you've never used Street View, it's lots of fun, though limited for small towns. There is a little yellow man icon in the lower right corner, if you pick him up with your cursor, you can move him to a spot on the map -- but only if that spot has been photographed by the StreetView Mobile. You can tell those roads because when you hover over them with the little yellow guy, a blue line appears on the street. Drop the little guy on one of those streets, and suddenly you are in a 3-D view of the town. To get back to the regular map, there's a "back to map" link in the lower left corner. With small towns, you usually only get the main street or maybe two main cross-roads streets. But that can be enough to give you a look at the character of the place. So you can pick a town and just research that, but my suggestion is that you pick three towns -- the one that seems the ideal size, and then the biggest that will still serve your needs, and the smallest. 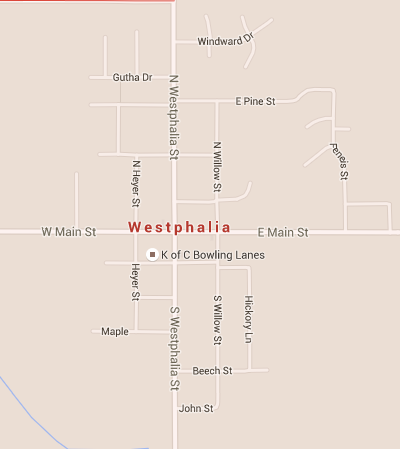 Just as an exercise, I'm going to suggest you look at a town called Westphalia, Michigan, which looks like a quintessential cozy small town. There's a smaller town near by called Pewamo (to the north west) and the large town of St. Johns a longer ways to the East. From this point we catch up with the people who already had a town in mind. We learn that there were 923 people living in Westphalia in 2010, and that it is located within Westphalia Township, which is in Clinton County. You can click on the links to learn more about the township and county, but for now, we just want to know their names, because this town might be policed by a force from the village, township, OR county. We also learn from Wikipedia about the demographics -- what race (and how diverse the town is -- which Westphalia is not particularly, but there appears to be at least one representative in town from each of the racial/ethnic categories measured by the census). You learn the median income, and how many young and old people. And there is a little about the history too. But Wikipedia doesn't a have any information about the police or fire or how the town governs itself. (Local governments -- mayors, school boards, etc -- often play a big part in cozy mysteries.) It also doesn't tell you the kind of businesses and services there might be locally. Is there a vet for your sleuth's cat? Is there an urgent care in town? How many restaurants are downtown? Remember: Every region will be different in terms of what size town will provide different things. Tiny suburban towns will depend more on larger nearby cities. Tiny rural towns need to be more self-sufficient. Tiny resort or vacation areas tend to need more resources in comparison to population, because they have visitors to serve. The south will be different than the north, etc. When I Google "Westphalia, Michigan Police" the first thing Google gives me is info on the Portland, St. Johns and Grand Ledge Police Departments (with the information that the Grand Ledge cops are closed on Sunday). If you scroll down the page, I find the "Village of Westphalia, Michigan" website. Town websites can be a treasure trove of info for the researcher. Some are amazingly full of information. (And some, sadly, are not.) I'll often find things that surprise me, even though I've been researching small towns for a while. And the first time you research small towns, you are likely to find a lot of things that surprise you. For instance Westphalia doesn't have a mayor, it has a president. Also, there is no police department -- for that you have to call the Clinton County Sheriff's office, which is run out of St. Johns (but is separate from the St. Johns Police Department). And when those Grand Ledge cops are closed - as mentioned at the top of the Google page -- the sheriff's department will likely be the ones answering the call. This is important to know when you are dealing with mysteries in small towns. Also, these are the sort of thing that can make for great plot turns. You call the cops, expecting to get the local cop who knows something about what's going on, and instead you get a deputy from three towns away. Looking at Pewamo, and their village website, I see a little more cultural information on their website. (This is common - often the tinier the town, the more the website is a work of love for some member of the community.) However we see NO mention of the police or fire departments. Not even references to the township or county. So, I Google Pewamo Police Department, and, wow, Google actually gave me a result! With a "street view" picture of the location and everything! Except that the picture just shows us a brake shop on the corner in the center of town. That would be cool if that were really the police department (a GREAT cozy mystery kinda quirk) but in fact, Google is just showing us the center of town. There is no police force to find, but Google is trying to be helpful here by showing me the town. Even after several different tries, I can't find any reference to how Pewamo is policed. If I were doing factual research, I would have to call the township office, but since we're just looking for a model for our cozy mystery series, I'm not going to bother. I'll just go with the Westphalia model, or go searching for another tiny town with more information. If I had gone on to research more towns, I might have found Bath Michigan. If you zoom in on Bath Township in Google Maps, it looks like it might be on a par with Pewamo. Similar number of streets, maybe a little more spread out. But Bath has its own police department. And if you look it up on Wikipedia, the population is listed as over 2000. Hmmmm. Well, the reason is simple: Bath is not a village or town. It's a township. Normally a township is not so much a governmental body as a simple geographic location. If you're from the midwest or west, it's how they measured the land before settlement: Each township is six miles square, with 36 one mile sections. They gave them names, but they didn't turn them into governmental bodies. It's just a way of saying where something is. And sometimes people in a township will charter a local government, and sometimes they don't. So the actual downtown of Bath is a teeny tiny town, with a police department and police chief -- but the township covers a lot of rural territory. Bath also has one other factor: it's right on the edge of a larger metropolitan area, so the population density in the rural areas is higher than usual. It has a whole lot of 5-10 acre farms, and 1-2 acre lots. However, Beulah happens to be the county seat for the smallest county in Michigan, which is very convenient, because it means that the county sheriff is centered right there in town. It's exactly as though Beulah has it's own police force, court system, jail and everything. But it's still a tiny town. ... sort of. It's also a resort town. The whole area is filled with summer cabins and little hotels and such. And so even though the permanent population is small, over summer ths population swells by four or five times. That gives the town resources to pay for that police force and all the amenities. Which means, for the writer and the resident, that it's a small town with a lot of the advantages of a big one. When I first researched the Benzie County Sheriff's department, they only had one detective, and his job, aside from following up on ordinary criminal reports, was mainly visiting schools for the drug education program. Now they actually have a detective bureau, which has a Sergeant who does most of the investigating, and supervises a number of patrol deputies who have detective training, and can be called on when needed. While I have plans for my Potewa force to grow a little, at the moment, I am using the more cozy model, where the detective is a guy who retired from a larger down-state force, to take a job up north where he could go fishing even if the pay wasn't good. As employers in the Traverse City area say: "A view of the bay is half the pay." The nature, power, size, relationships of your police department is going to be affected by the nature of the community. The example above, about the detective who just wants to go fishing: that community is ideal for a cozy mystery. The whole culture is oriented toward leisure and positive things. Even back in the day of the first puritan settlers -- they came to the wilderness to establish a college which would accept people of all races, creeds, colors and both sexes. And I don't know if it was the beauty of the place, or the stars in their eyes, but these dour congregationalists evolved quickly and easily from people who wanted to make the world better, to people who wanted to make the world happy. And that affects the police department, especially in fiction, where details have extra meaning. It effects the character's backstory: how the members of said department came to town, and how they interact with the town. In case of my series, the sheriff's family goes back for generations, so he naturally takes a host-like attitude to those around him. And this is true for many of his deputies. Others, like the detective, are very relaxed, because this, to them, is a place of vacation. He may be just putting in time at work, but always with a smile because he's going to be fishing as soon as he clocks out. And I think that also effects what the mission of policing is: in a resort community, policing has a lot in common with playground supervision and bar tending. A lot of crowd management, dealing with customers who are having a bit too much fun. And this leaves an opening for your amateur sleuth, because in a resort town, the police are busy. On the other hand, I once lived in a small rural town where the job of the police was to make sure nobody ever presses charges. Seriously, the town had no budget to prosecute, so even though it had a lot of ordinances, the police could only enforce them if one of the council members was the complainant. And that wasn't because they were sucking up to the boss, but rather because the council members were the only ones who could release the funds to prosecute. This also not a bad model for the cozy mystery writer, because it means that the police must be diplomats, talking to everyone, calming everyone down... but also maybe a little reluctant to press anything too far for fear they'll get into a situation they wont be allowed to deal with. And that leaves an opening for the amateur sleuth to be hard-nosed and press on in investigating the case. However, you do it, research doesn't just give you facts or accuracy, it also gives you hooks into interesting situations and details, so you can create a fascinating place for your readers to cozy into. I've rambled on long enough. (Sorry that it IS a ramble -- don't have time to rewrite and edit.) Got to get back to my family history research. I'm finding an awful lot of inspiration right now (not that I need any more). Not a ramble at all...some very good points in here and great research tips. Part of the reason I researched my own books was actually because I knew the towns I was working with, but I realized that I had no idea about how Beulah and the area was policed. So I checked it out out of curiosity rather than as research. Then I realized there were a whole lot of useful things I didn't know. The main problem with online research is that it can be addictive and end up taking all of your time. But it is fun. I might do another post or two about historical research, since I'm doing so much right now that would be useful to people who write historical mysteries, AND to those who might have a backstory to a contemporary mystery that goes back a few generations. What is a Novel Dare? Check out My Book List page for a list of all of my books and links to all vendors. New Mick and Casey mystery! A western mystery, and ghost story. Collected episodes of this blog's first serial. Five short crime or twist stories. A melodrama, a journey, a romantic adventure. Some of the links lead to Amazon.com. If you follow them and buy something, I will get a small share of the proceeds. Every penny of that will go into my Summer of Writing Fund, which will allow me to take some time off in the summer and concentrate on writing. Contents copyright 2009, 2010, 2011 Camille LaGuire. Powered by Blogger.